The political illusion of 'independence,' but the reforms are on the mark. It appears that Mitt Romney wants to join every President since Richard Nixon who has declared the goal of American "energy independence" and then never delivered. With the exception of that patently political soundbite, the energy plan that the GOP candidate rolled out Thursday is an unusually sane document, in contrast to the fad-obsessed tradition of the last 40 years. The asterisk on the Romney goal of energy independence by 2020 is that he refers to North America, which if you include Canada and Mexico is the fastest-growing energy production region in the world. The U.S. Energy Information Administration projects that over the next 25 years, and even as oil consumption rises, net U.S. imports will fall to 36% from 49% today, two-thirds of this "foreign oil" coming from Canada and Mexico. The U.S. will also become a net gas exporter from an importer today. The reasons include rising domestic production as a result of the hydraulic-fracturing boom and improving energy intensity (how much energy it takes to generate a dollar of growth). The dividends are paid in more energy security: a durable and reliable world market that can meet demand through competitive prices. "Independence"—the proper term for a closed economy that doesn't trade in energy would be autarky—is a mirage. The "independence" trope always polls well, but it is also dangerous because it opens the political field to rent-seeking dreams. Any energy source that can be sold as making the U.S. more "independent" is therefore a candidate for corporate welfare, and Mr. Romney's blueprint proves the point by endorsing the corn ethanol mandate. This is a play to increase energy imports, or at least seven electoral votes, from the sheiks of Cornistan—er, Iowa. The Renewable Fuels Association ethanol lobby promptly put out a press release lauding Mr. Romney's "commitment to domestic renewable fuels." This political bow and other false promises are merely setting up his potential Administration for failure. Yet given the bipartisan neuralgia of U.S. energy politics, perhaps this was inevitable. George W. Bush was careful to avoid the phrase energy independence amid his green energy folly after 2006, but he nonetheless bequeathed to taxpayers the switchgrass illusion and the loan program that the Obama Administration expanded and used to back Solyndra. John McCain campaigned on the contradiction of "Drill, Baby, Drill" and end-is-nigh global warmism. In 2008 Senator Obama pledged to "end the age of oil in our time," which he said "would take nothing less than a complete transformation of our economy." How's that going? Mr. Romney recognizes the real transformation is gushing from abundant and cheap fuel in offshore and "unconventional" sources like shale rock, oil sands and abandoned wells. This is a gift of geology and human ingenuity if there ever was one. It has the potential to lower costs for consumers and provide a competitive edge for U.S. industries down the energy chain like manufacturing, chemicals, steel, technology. Citigroup analysts suggest real GDP will be 2% to 3.3% higher annually than it would otherwise be through 2020 as a result of this U.S. energy revolution. 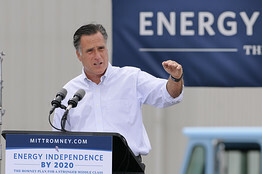 Mr. Romney wants to make this energy forecast even more bullish by making it easier to expand oil and gas supplies. Notably, he'd devolve regulatory control over federal lands to the states, provided they ensure a safe and predictable system within their borders. Fracking and other development is now surging on state and private property, but federal acres open for leasing and exploration have fallen 18% since 2008. The rate of permitting has slowed by 37%; it takes 307 days on average to get a drilling permit. North Dakota does it in a week and a half, Ohio in two. Mr. Romney would also streamline the larger federal regulatory state, which takes seven years to approve a major energy project when it does it at all. Think: Keystone XL pipeline. In 2010, the Chamber of Commerce identified 351 projects delayed or rejected by the feds that would have created more than a million jobs and added $3.4 trillion to growth over time. Re-electing Mr. Obama means doubling down on this status quo, and it's an even bet that the Environmental Protection Agency finds an excuse to shut down fracking. A unit of energy is a unit of energy, so the main role for Washington should be creating transparent, stable policies so private investors can apply their inventiveness to keep supplies growing and prices low. Mr. Romney's ideas would help markets do precisely that, even if they come in all-too-familiar political packaging. The USA has the potential of energy independence by the early 2020's. This country has the resources and technology to achieve independence if there is a compelling reason to do so. Over the next 25 years the US could become a large exporter of fossil fuel energy. With the advent of fourth generation modular nuclear reactors the production of oil shale (kerogen) will become economically very attractive.